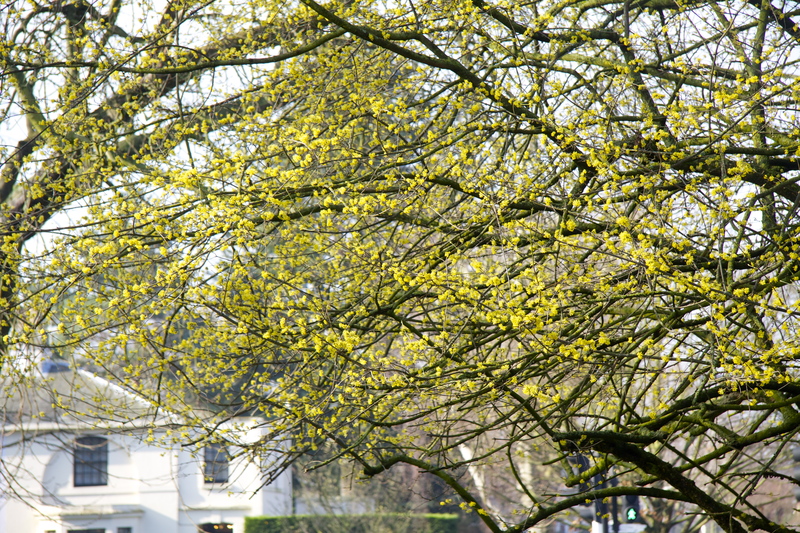 Cornus mas – or the Cornelian Cherry – at the perfectly groomed Dulwich Old Burial Ground in South London. Friends who visit Dulwich Village from Islington perhaps or Kent are always amazed to find a small section of picture-perfect Connecticut in South London, ten minutes from Victoria station. 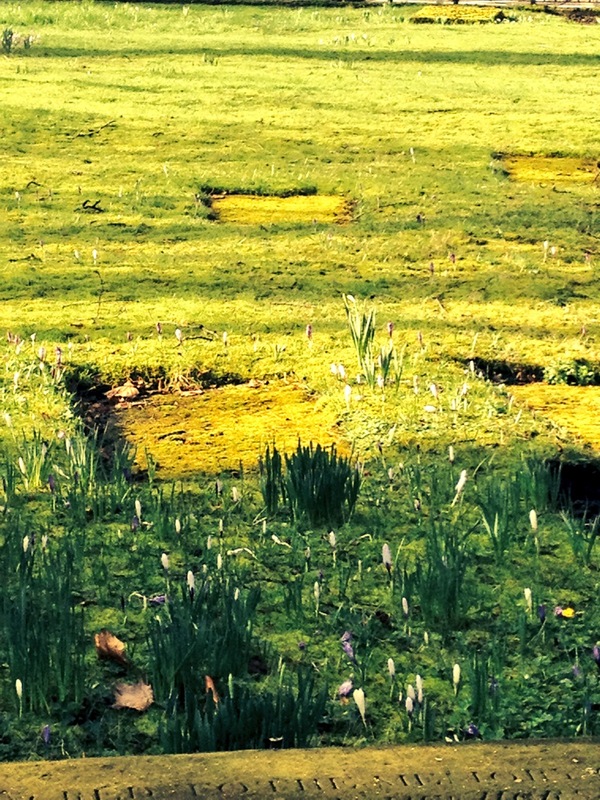 Saturday was a morning of glowering sunshine and the long dead inhabitants of the 400 year old cemetery were making earnest attempts to kick start the spring. The velvety day-glow green and yellow grass was erupting all over with silvery crocus buds and dense stooks of deep green narcissus foliage. 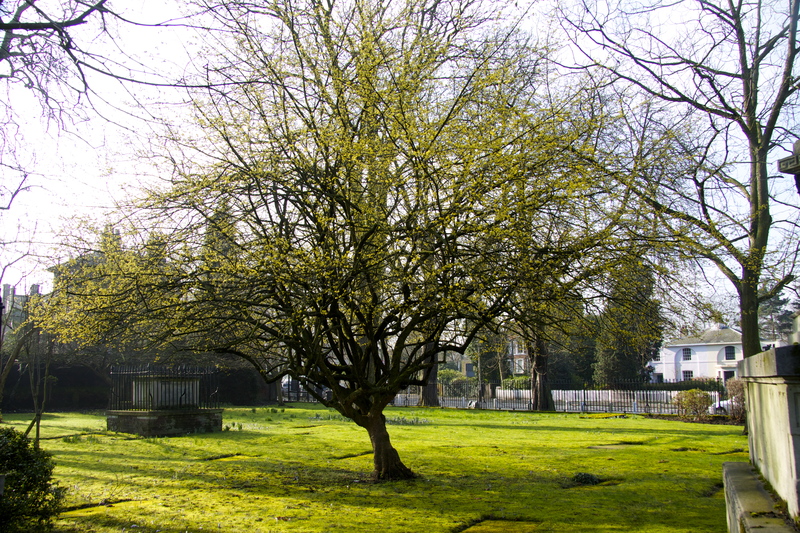 I was in Dulwich to pay homage to my favourite specimen of Cornus mas – the Cornelian Cherry – which is the centrepiece of a beautifully groomed burial ground in the middle of the village. 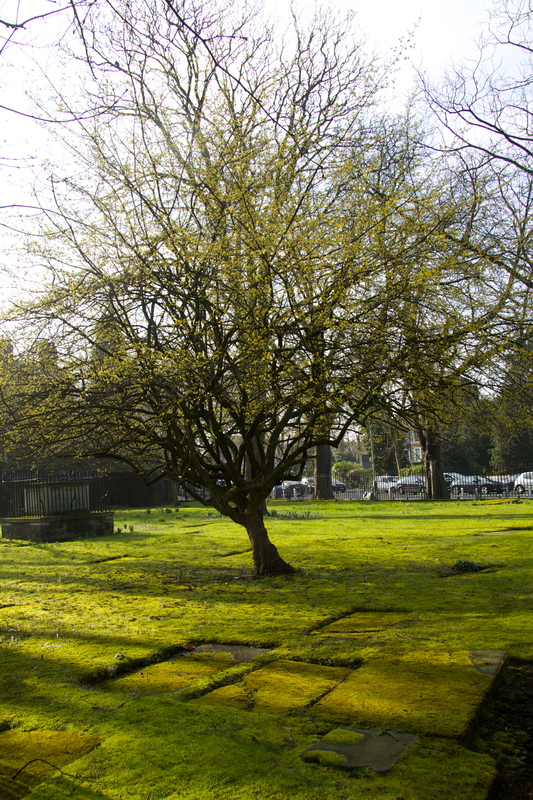 The burial ground is home to a dozen Grade II listed eighteenth and nineteenth century tombs of wealthy locals, the graves of 35 victims of the plague in 1665 and where Old Bridget the Queen of the Norwood Gypsies was buried in 1768. Cornus mas is a densely branched, deciduous, large shrub or small tree with small umbels of brilliant yellow flowers in late February and early March. It can be a rather unassuming tree but when given space – as it is here, the absolute queen amongst pale stone and open lawn – it can offer a sensational cloud of light and colour on the darkest of February days. The advantage of giving the tree this sort of space is that it will have a much greater impact later in the year too, when it is in leaf. The potential for Cornus mas to be a really handsome specimen tree year round has now been realised by nurseries selling mature trees and if you have the room and the funds you could source a really handsome, spreading, semi mature “umbrella multi-stem’ from a nursery such as Deepdale Trees which supplies trees for many of the Chelsea Flower Show gardens. Tree and shrub specialists Bluebell Arboretum and Nursery recommend Cornus mas ‘Golden Glory’ AGM for its particular abundance of yellow flowers. 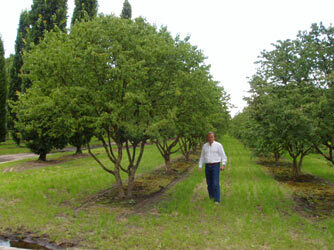 After a hot summer, ‘Golden Glory’ may produce a small crop of small, shiny, edible red cherry-like fruits in autumn. If, however, you’re after a jar of the elusive – and let’s face it, ultimate weekend gift – homemade Cornelian Cherry Jam -the one to go for is Cornus mas ‘Jolico’ which the nursery describes as a ‘charming German form’ first selected to be used for commercial fruit production and which produces vivid red berries up to three times larger than those of a classic cornus mas. 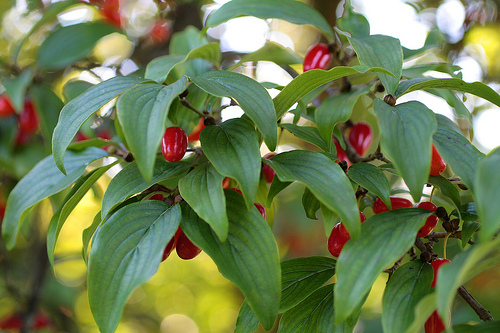 Shiny red fruit of Cornus mas – like miniature scarlet plums. The fruits of the Cornelian cherry are always bitter and need vast amounts of sugar to make them palatable but the idea is very romantic. Try Almost Turkish Recipes for a reliable recipe. Whilst waiting for your ‘Jolico’ to mature, maybe practise making the jam after a trip to the market on your next Mediterranean holiday? In the meantime I am back in the UK on a stormy Saturday, on my way to the Royal Academy. I have been seeing posters all over town for a small exhibition of prints by Norman Stevens. 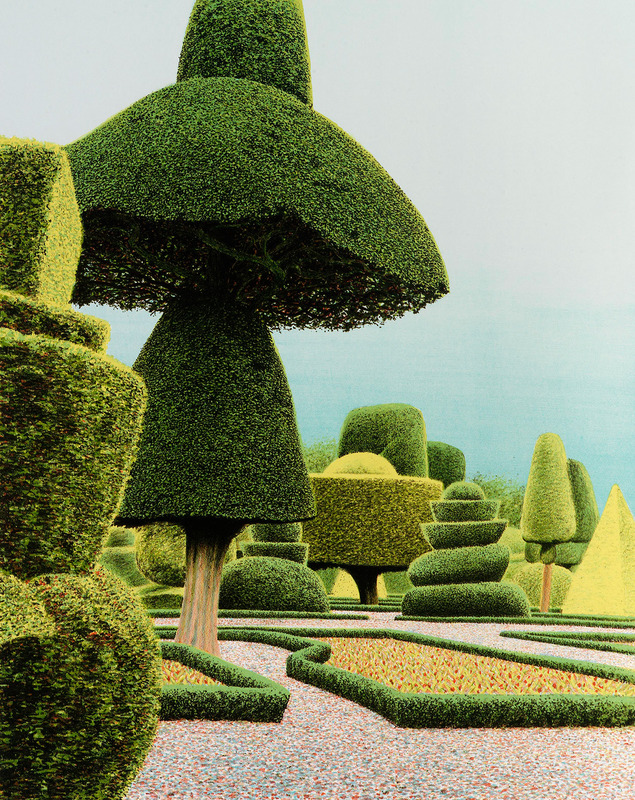 I can’t get the luminous, sculptural, bonnet-like image of the Topiary Gardens at Levens Hall – a gorgeous fourteenth Century Manor House in the Lake District – out of my head. There is something about the quality of the light and the rigid laciness of the foliage against the blue of the sky that makes me uncertain at first as to whether it is even a photograph or a print. 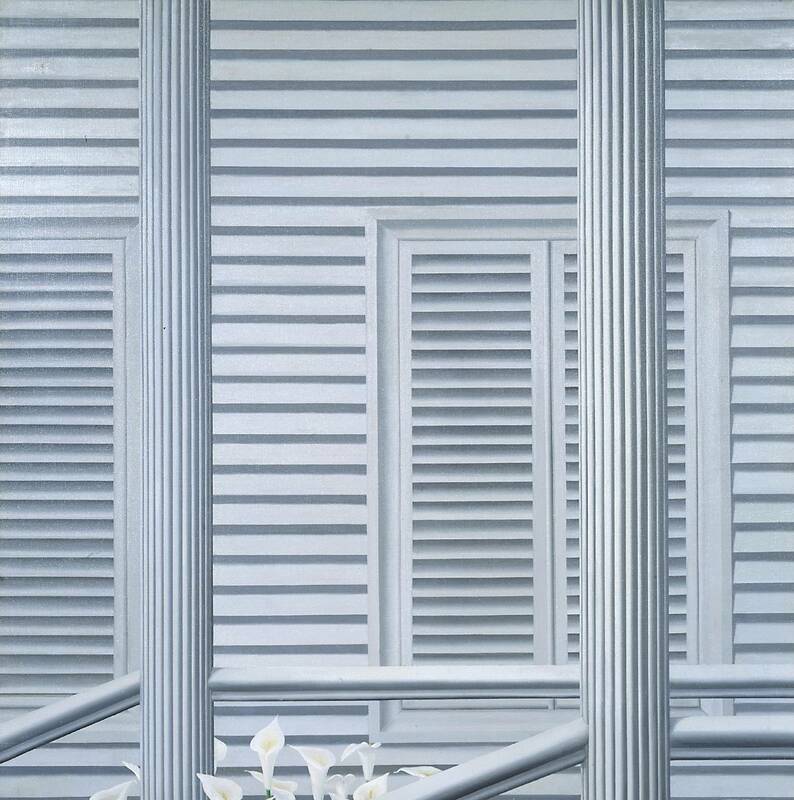 Norman Stevens (1937-88) studied painting at Bradford College of Art along with a particularly talented group of artists included David Hockney. 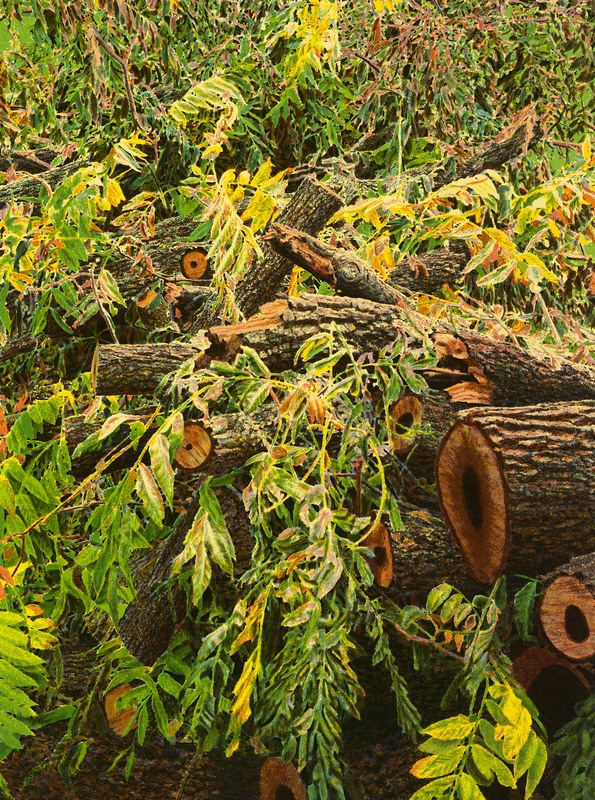 Originally a painter, he began printmaking in the early seventies and is now regarded as one of the foremost printmakers of his generation, revered for the way he always pushed boundaries with laboriously achieved effects of aquatint and mezzotint – and later screen prints -to create tone and texture, soft grain effects and even the appearance of water colour washes. There is a beautiful print called The Darkling Thrush made in 1976 to illustrate a volume of poems by Thomas Hardy. A wonderful, tunnel of a path formed from tangled scratchy black branches with grey-white blossom against a salmony, metallic-pink twilight sky. There is a Japanese quality of restraint and delicacy to this atmospheric work. 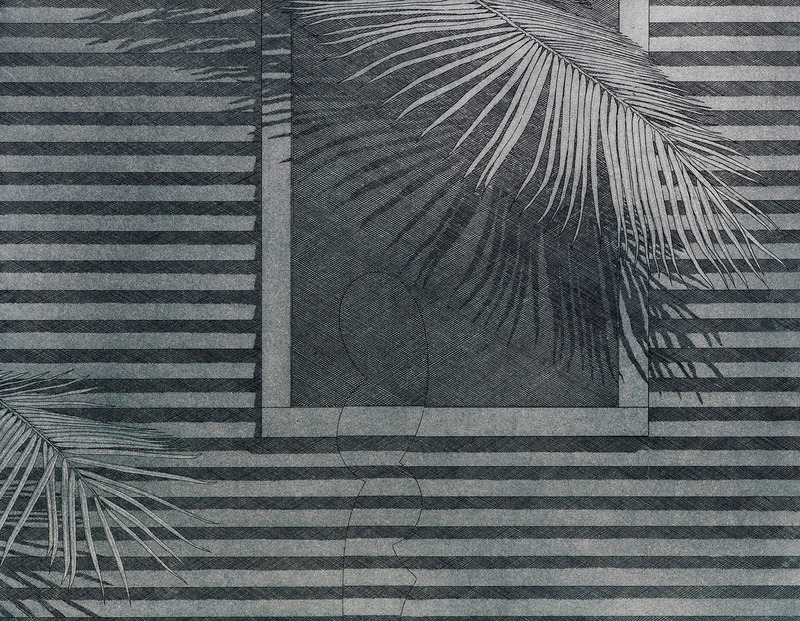 But what I have really come for is Stevens’ etchings of topiary in great English country gardens – a dream world away from his crisp, California-inspired earlier work, with paintings and prints of white louvred windows, clapboard buildings and the foliage of tropical plants. The Royal Academy exhibition features work inspired by the Victorian country house, Knightshayes Court in Devon, Painswick Rococo Garden in Gloucestershire and of course, Levenshall Topiary Gardens in Cumbria. 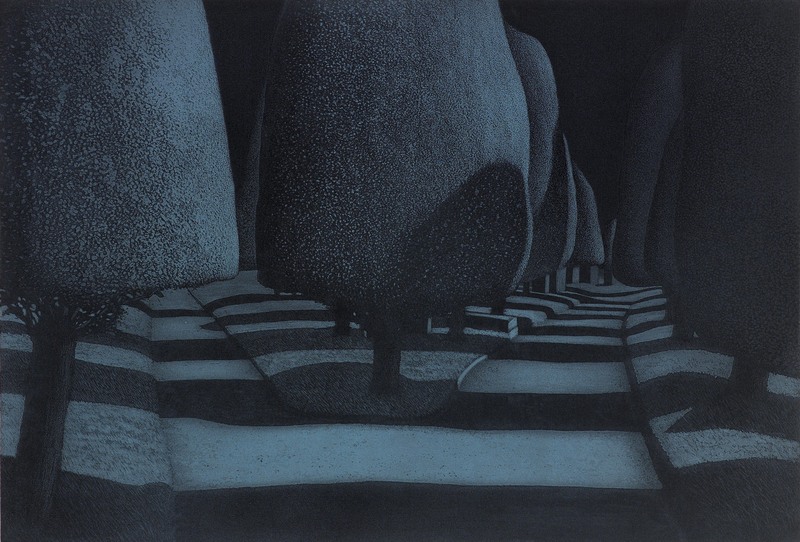 I am entranced by ‘Painswick Moonlight’ a finely worked, almost stippled, image of an impossibly perfect, dark, moonlit world of ranked monumental trees and mesmerisingly stripey shadows. 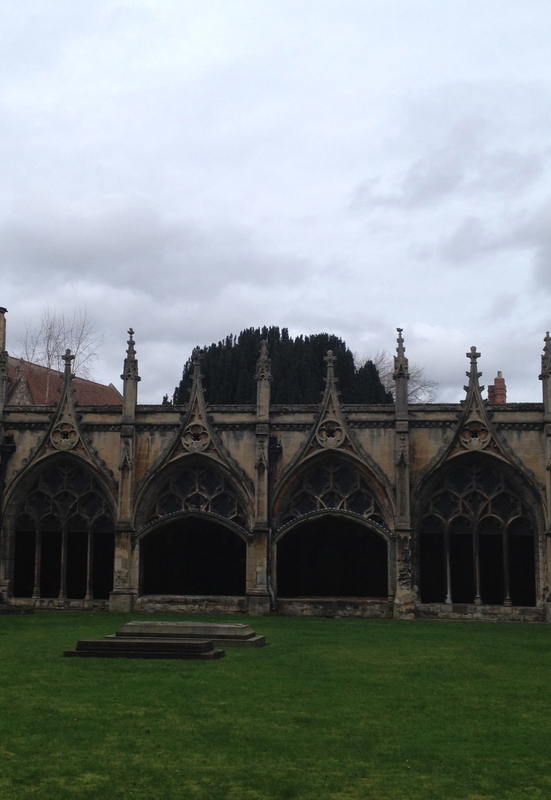 By Sunday evening I am walking through the cloisters of Canterbury Cathedral with one of my sons on the way to Evensong. 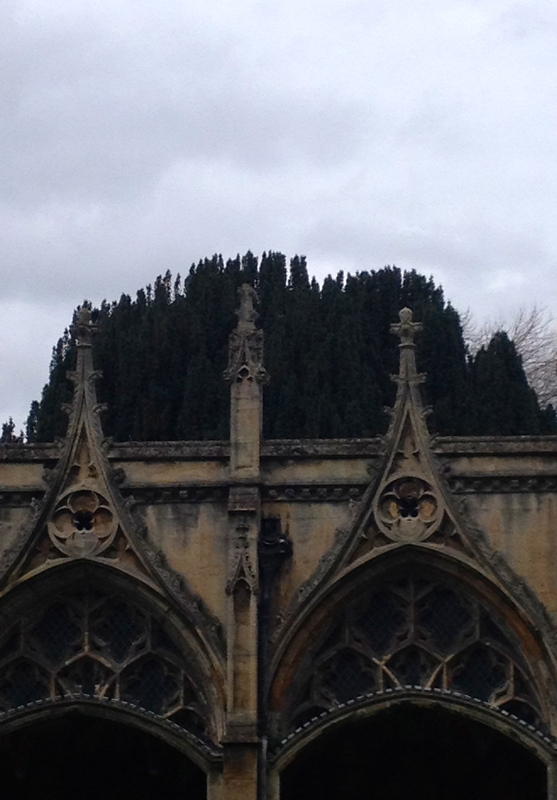 I love the way the freeform yew mound peers, monster-like over the finely carved decorative roof. 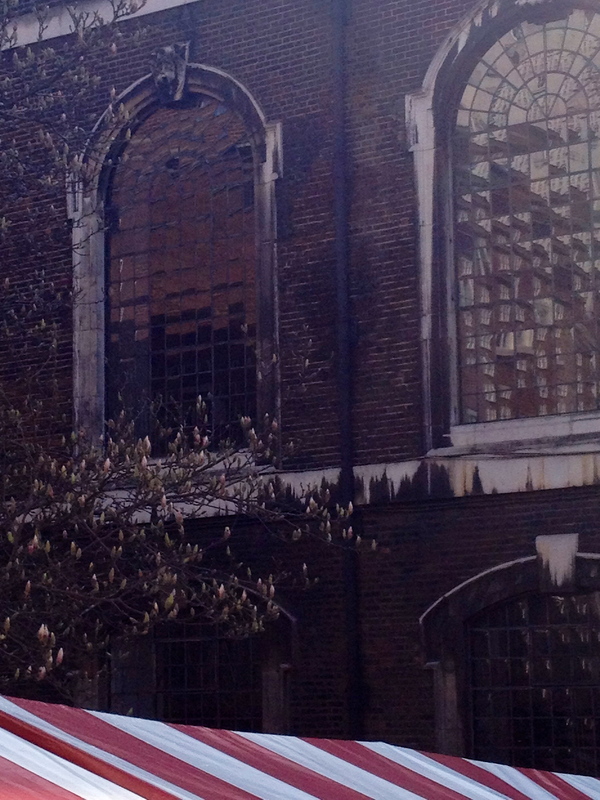 I think Norman Stevens would have enjoyed the rhythmic archctecture and the shadowy presence of plantlife. This entry was posted in Gardens and tagged Almost Turkish Recipes, Bluebell Arboretum and Nursery, Canterbury Cathedral, Cornelian cherry, Cornus Mas, Cornus mas 'Golden Glory' AGM, Cornus mas 'Jolico', Deepdale Trees, Dulwich Burial Ground, Dulwich Village, Knightshayes Court, Levens Hall, Levens Hall Topiary Gardens, Norman Stevens ARA, Painswick Rococo Gardens, Piccadilly, Royal Academy, St James's Church, Thomas Hardy on March 5, 2014 by nonmorris.